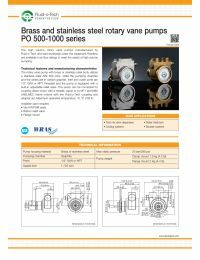 Fluid-o-Tech PA0801HNEDN0000 is a high volume rotary vane pump. The PA0801HNEDN0000 has an NSF approved Buna-N seal, and a flow rate of 250 gallons per hour. The pump housing is constructed out of stainless steel, and comes with a three bolt flange mount and a pressure bypass.